Rashes and stomach aches are common in children and are rarely serious, but when your child has them it can be scary. A stomach ache can make your child feel miserable, and you may worry if he isn't eating or drinking as much as usual or starts vomiting. Rashes can be disturbing as you wonder whether the condition is contagious and how long it might last. A rash is a discoloration of the skin. It's usually red and can consist of spots, blotches or lacy patterns. Some rashes are simply discolored; others are raised so that you can feel them when you rub the skin. Some rashes are itchy or painful, but sometimes your child won't feel the rash at all. According to Dr. William Sears, most rashes do not require emergency treatment. However, if your child has a rash that looks like tiny red spots that are flush with the skin, not raised, and they don't fade and then return when you press on them, visit the doctor right away. With other rashes, you can call and make an appointment to be seen if you're concerned. 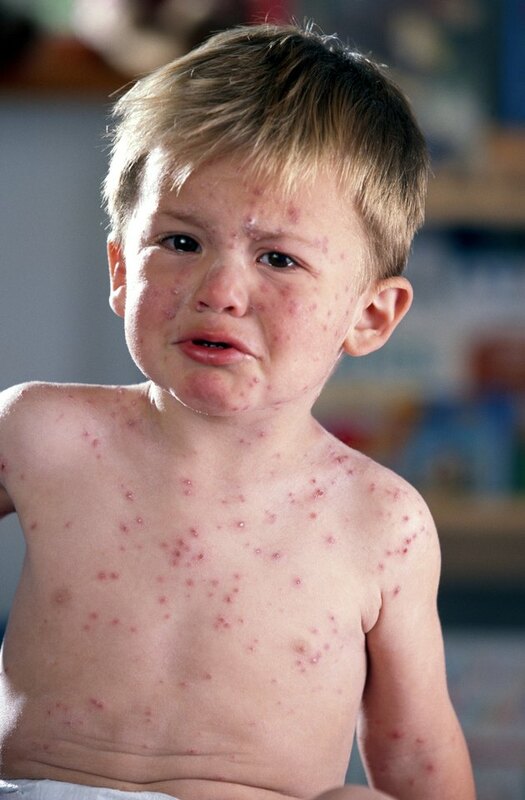 Some rashes, such as chicken pox and fifth's disease, are caused by viruses. These rashes are contagious and can be spread from your child to other children with whom she comes in contact. Other rashes are the result of contact dermatitis, or touching something that irritates the skin. Some children develop a rash as a result of a food allergy. Hives are usually the result of an allergy; hives look like red blotches and may have white centers. They're usually itchy. Stomach aches are most often caused by gastroenteritis -- more commonly known as a stomach bug or the stomach flu. This stomach ache is usually accompanied by nausea, vomiting or diarrhea. A fever may be present. Your child may also have a stomach ache because of allergies, constipation or stress. If your child has a fever and a stomach ache, especially if it's centered around the lower right abdomen, it could be appendicitis and requires immediate medical attention. If your child is vomiting or has diarrhea, try to keep him hydrated by offering an electrolyte solution, broth or other clear liquids. Have him sip these frequently throughout the day. If your child has a rash that looks like multiple bruises on the legs and buttocks along with a stomach ache, she may have Henoch-Schonlein Purpura. Joint pain may also be present. If your doctor suspects that your child has this, he can order tests to make a diagnosis. There is no cure, but symptoms can be treated and controlled and the illness usually goes away within six weeks.